It happens to all 944 owners eventually. While dutifully checking your oil level, you see something funny, something dirty, inside the coolant reservoir tank. On closer inspection, your heart drops as you confirm the worst: oil in the coolant -- the automotive equivalent of coughing-up blood. Oil in the coolant tank is the most obvious sign that the oil and coolant are mixing. Mixing can go in both directions of course, so it is not uncommon to find coolant in the oil when things go wrong. When it gets bad, the oil will take on a chocolate brown milkshake look, but early signs also can be seen as a brown or yellowish film in the oil filler cap. However it gets there, coolant in the oil is bad for the friction surfaces of the motor, including in particular the rod bearings. Porsche recommends replacing the rod bearings anytime a motor is repaired for mixing. Legions of home mechanics have played the odds and survived without new bearings, however, so you will not be alone if you go that route. Mixing of oil and coolant can usually be traced to either a leaking head gasket or bad seals in the oil filter housing. A bad head gasket can usually be diagnosed with a compression check and leak down test. A bad head gaskets also tends to show other symptoms like overheating, steaming exhaust, lumpy idle, one steam-cleaned spark plug, etc. Assuming your head gasket checks out, it’s generally time to change the oil filter housing seals when the oil and coolant start to mix. This article details the procedure for changing the seals on a 944 turbo. Before starting, be aware that this is a messy job. Anything that can leak or ooze on your face, will. Goggles are a necessity to protect your eyes from coolant, oil, power steering fluid, road grime, and the seemingly endless supply of slurry that will ooze out as you do this job. Mess aside, the job is well within the reach of the typical home mechanic. The biggest challenge for the 944 turbo owner is just getting the right information about the parts and procedures involved. There are several reasons why this can be a challenge. Most of the written procedures for doing this job are based on the non-turbo 944. On the non-turbo cars, the housing holds an oil cooler, and has several other internal parts that are not used on the turbo motors. This is why many 944 turbo owners refer to it as an oil cooler housing, even though there is no cooler in the housing. Instead, the housing on the turbo motor holds an oil thermostat and fittings for an external cooler. When reading-up on this job, the turbo owner typically has to ignore some steps specific to the non-turbo, and fill in a few blanks only applicable to the turbo. Similarly, the re-sealing kit sold by Porsche was made for the non-turbo motor and includes several parts that are not used on the turbo motor. To further complicate things, Porsche updated several parts in this area throughout the production of the 944 turbo. Most significantly, there were no fewer than four different oil pressure relief valves used on the 944 turbo. This valve screws into the oil thermostat housing, and must be removed and replaced to change the housing seals. It is important to identify which valve you have so that you can obtain the correct o-ring and installation tool, as described below. The purpose of this article is to bring together all of the information and part numbers needed to guide the 944 turbo owner through the entire process. So, grab your socket set and read on for step-by-step instructions specific to the 944 turbo. 1. Put the Car on Jack Stands. Use great caution to secure the car. You will need enough access to work under the front of the car. Never work under the car supported by a hydraulic jack, and always make sure your car is securely raised on jack stands. If you are not comfortable getting the car up on jack stands safely, then this job is probably best left for a professional mechanic. 2. Remove Engine Trays. Remove the metal and plastic trays under the engine, using a 10mm wrench and socket. 3. Drain the Oil. Ideally, the motor should be warm for this, but there will be plenty of time (and places) for cold oil to drain, so warming the engine is not critical. The oil drain plug uses a 15mm socket, and can be tight. Save the aggravation and use a ½ inch socket and breaker bar. Be sure to use a new crush ring when re-installing the drain plug, and torque it to 36 ft. lbs. 4. Remove Oil Filter. The filter should come off without tools. It’s a mess every time, since the oil tends to leak (pour) out the bottom of the filter when it unscrews. However, you will have ample opportunity to clean up under the filter when doing the seals. 5. Drain the Coolant. Remove the reservoir cap first, then remove the blue plastic plug at the bottom of the radiator. Or, remove the bottom radiator hose. Both methods result in a mess, as the water tends to hit the lower lip of the front air dam. Catch as much as you can in a bucket, and dispose of properly. Be sure to keep it away from pets and animals, as it can be lethal to them. 6. Remove Power Steering Pump. Start by removing the hydraulic lines. The lines have been updated, so you will either have two banjo bolt fittings, or one banjo bolt and one hose-clamp. The banjo bolts are removed with a 19mm open end or flare nut wrench, while the hose clamps need only a screwdriver. Have a bucket handy to catch the power steering fluid when you remove the lines. With the lines removes, go up top and use a screwdriver to loosen the big band clamp holding the power steering reservoir to the fender. Pulling the reservoir out of the car gives you some additional working room you can use later, and eliminates one of the many things that will otherwise drip on your face while under the car. Next, loosen the jam-nuts on the power steering tensioner rod. The nut nearest the outside of the car is reverse threaded, so with a 13mm wrench pushed onto the nuts from below, both jamb-nuts are loosened by pushing the wrench toward the rear of the car. Be sure to counter hold the tensioner with another 13mm open end wrench. Turn the tensioner to loosen the pump enough so that the belt can be removed. Pull the bolts holding the tensioner. Don’t be tricked into trying to remove the nut. It is welded to the pump. The rear pivot point it a 13mm bolt. The front is a m13mm nut. Once the nut is off, slide out the black spacer, and the pump will come out. This picture shows the spacer that needs to be removed in order to get the pump off the bracket. 7. Loosen and Lower Sway Bar Bracket. The sway bar is anchored to the floorboard by two brackets, one on each end. Remove the two 13mm bolts holding the brackets to the fllorboard (two per side, four total). Spin the bracket on the oil filter side down to improve access to the area. By removing the brackets on both sides, you will give yourself some extra play with the sway bar itself, which will give you more room when you need it. 8. Remove the oil pressure sending unit. First, remove the 2 electrical connectors. One is a spade connector that just pulls off. The other requires that you remove an 8mm nut to get it off. The unit itself is removed using a 24mm open-end wrench. If the sway bar is in the way, you should be able to pull it down a bit (with the brackets removes) to get a 24mm (15/16 inch) open end wrench on the sender. If you are having access troubles with the big wrench, you can also try a smaller adjustable end wrench, or spring for a ‘stubby’ 24mm wrench from Sears. 9. Remove the Oil Pressure Relief Valve. The valve should come out without much problem, using with a 24mm (15/16") socket. Take note of the type of valve you have, as it will impact the type o-ring (if any) you will need on re-assembly, as discussed below. The yellow arrow points to the valve in the picture above. 10. Remove the Oil Cooler Hoses. In theory, this is done using 32mm (1 1/4") and 27mm (1 1/16") open end wrenches. Counter hold the 27mm fitting on the oil filter housing with the 27mm, and loosen the 32mm fitting on the hose. I could not get my oil cooler lines off on the filter housing side, so I ended up cutting the lines off, where the rubber meets the metal, using a razor blade. Needless to say, you will need new oil hoses if you go this route. Once on the bench, it became clear why I could not get the hoses off. They took a great deal of force to remove, which was just not possible to apply in the cramped confines of the engine compartment. (It may be worth soaking the fittings with PB Blaster or Liquid Wrench if you have the time.) See step 15.b. below for information about the official replacement pipes. 11. Remove Heat Shield. Loosen the heat shield above the oil housing (just under the header) by removing the two 10mm bolts holding it onto the oil filter housing. The shield is actually three separate pieces bolted together with three 10mm bolts. Two of the bolts are visible and accessible from below. The third bolt is only visible from above. You need to slide the heat shield around until the third bolt is accessible between the header pipes. Don’t be fooled into trying to loosen any of the nuts on the heat shield – they are welded in place. Once you remove the third bolt, the heat shield will fall apart into three pieces. Once in pieces, the separate pieces can be wiggled out of the car from below. Removing the heat shield will provide the space needed to get the oil filter housing out once unbolted. With the heat shield in the car, it is very difficult to get the housing out of the engine bay. 12. Remove the Oil Filter Housing (finally). Remove the four 13mm bolts holding the housing to the block. Looking at the side of the block, all but the upper right bolt is reasonably easy to reach. The upper right bolt is just under the #4 header port. It is not an easy bolt to reach, but it can be removed without removing the header. One proven option is to use a 3/8" drive 13mm swivel socket, a 3/8" to 1/2" adapter, a short 1/2" extension, and a 1/2" ratchet. Here’s a picture to show it can be done. Once the four bolts are removed, it takes some maneuvering to get the housing out, but it will come out as long as the sway bar is unbolted and its bracket is out of the way. Here is the housing freed from the engine bay. Here is the same housing after scrubbing for an hour with Simple Green and a tooth brush. 13. Install Gasket and O-rings on Housing. This is the ultimate point of this job – replacing the large integral gasket (944 107 147 03) on the face of the housing, and the two o-rings (999 707 043 40) on the oil connector pipe. The picture above shows the large integral gasket installed on the housing. It only goes on one way, with the thick green gasket material filling the groove around the perimeter of the housing. The picture also shows the short connector pipe (pointing toward the camera) that carries oil to the housing. This pipe needs to be pulled out of the housing so that both o-rings can be replaced. It should pull out by hand. If not, you can wrap a towel around it and gently grab it with pliers. The connector pipe has a groove on both ends for o-rings. Like so many other parts in this area, the connector pipe was updated by Porsche. The original pipe is not symmetrical – the o-ring grove is closer to the end on one side. 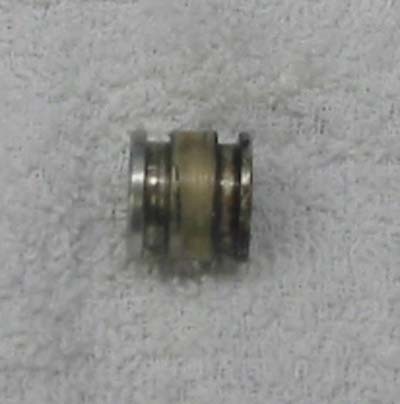 With the updated part (951 107 152 03), the o-ring groove is in the same location on both ends. The part was updated because the o-ring would not always reach into the housing deep enough for the o-ring to seal. To ensure this will not be a problem, it is important to install the pipe all the way into the housing. If you are using the old non-symmetrical pipe, the end with the groove closer to the end should go in the housing. The other end goes in the block. This allows the o-ring to get a good grip on the housing. When installing the housing, be sure not to let the pipe pull out of the housing. 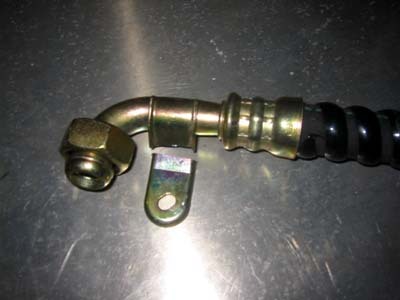 If you need to pull back on the housing once it is plugged into the plug, be sure to pull it all the way out and fully reseat the connector pipe into the housing. To be safe, it is probably worthwhile ordering the updated connector pipe (which is all that Porsche now sells), for added peace of mind. Also, there was a technical service bulletin 19105, which suggests installing washer part 928 107 166 00 in the block port, using Locktite 638, if the port measured more than 14.2mm deep. This was obviously another attempt to keep the connector pipe seated deeply enough in the housing for the o-ring to seal. Using the updated connector and taking care to ensure it remains fully seated in the housing during installation appears to be sufficient for a good seal, however. Here is the original pipe. You can see that the lip on the left end is thicker than the lip on the right end. On the updated pipe, the lip is the same width on both ends. 14. Install Housing and Oil Pressure Relief Valve. With the gasket in place and the o-rings and connector pipe fully seated in the housing, re-attach the housing to the block by re-installing it four 13mm bolts. Before tightening the housing bolts, insert the special alignment tool (Porsche part 9215 for 1986 motors; Porsche part 9262/1 for 1987 and later motors) all the way into the oil pressure relief valve port. It helps to put a light coat of oil on the alignment tool to allow it to slide in and out easily. Slowly tighten the four mounting bolts for the housing, making sure that the alignment tool continues to slide in and out of the port easily as the bolts as tightened. Torque the mounting bolts to 14 ft. lbs. Remove the alignment tool once the housing bolts are fully tightened. Next, install the sealing washer (Porsche part N 043 815 3) on the oil pressure relief valve. If using a one-piece valve, also install the o-ring on the groove at the end of the valve (Porsche part 944 107 935 11 or 999 707 145 40 for 1986 motors; Porsche part 944 107 935 01 or 999 707 144 40 for 1987 and later motors). Install the valve into its port on the oil thermostat housing and torque to 33 ft. lbs. There has been some confusion about whether the OPRV takes one or two o-rings. According to Porsche TSB 19017 (October 9, 1990), all of the one piece valves have one external o-ring (visible on the tip of the OPRV) and one internal o-ring (only accessible if you disassemble the OPRV). Typically, when you pull the OPRV to do the seals, you will have no reason to disassemble the valve and, accordingly, you will only replace the one o-ring visible on the tip. Disassembling the OPRV is beyond the scope of these instructions, but if you do end up disassembling the part and need the second o-ring, the internal o-ring is part No. 999 107 146 40 for the 86 retrofit valve, and 999 107 144 40 for the '87 and later valves. a. Oil Sender. Reinstall oil pressure sender and torque to 25 ft. lbs. Be sure to reattach both electrical connectors on sensor, paying attention to get the wires back on their original posts. Here is a picture of the hose showing where I cut the bracket off. c. Sway Bar Mounts. Reattach both sway bar mounts – two 13mm bolts per side. d. Re-install Power Steering Pump. e. Re-install Power steering belt. f. Re-install Power Steering Reservoir and Hoses. g. Re-attach Radiator Hose and/or Close Drain.